Esther, the lady who brings vegetables to our doorsteps daily is a petite woman, but very strong. When she started coming to our building last year, to sell vegetables, she was shy, meek and rarely smiled. As time has gone by she has become more confident, strong, smiles and even jokes with us. She will usually ring my neighbour’s and my door bell at the same time. The minute I greet my neighbour with Jay Shri Krishna, Esther too will respond and immediately tells us not to start our talk as she is getting late. She wants us to buy the vegetables quickly and disappear behind our doors. This morning I wanted to buy some tomatoes and told her that Ksh 100 is too much. Immediately her response was okay then buy it for 120!!!! Today she also bought the freshest white radish with the leaves intact. I bought nearly 5 of them from her… you know I go mad when I see fresh vegetables and fruits. With three of them I made sabji and the other 2 were used to make mooli parathas. I made it in Gujarati style, mixing the radish and leaves into the dough. Next time will try the punjabi style of stuffing the dough. I added garlic and the taste was amazing. Next time though I will add more leaves. I love the peppery taste of the leaves and the pungent taste of the radish. Coming back to Esther, pretty soon she will be on maternity leave. She is in her 7th month and still manages to carry a heavy kikapu (basket) of vegetables on top of her head. When I voiced my concern about her carrying heavy load, she simply replied that I should not worry as this is her 8th pregnancy. When I asked her why she decided to have so many children and wouldn’t it have been better to have just a couple and improve their lives by giving them better education, clothes and food. She replied that she has a large farm that feeds all. What baffled me was that for her feeding her kids was all that mattered. When I asked her that wouldn’t she want to dream of a better life for her kids by educating them, she told me I was wrong in thinking that way. When I asked her why she so matter of fact replied that the best profession is farming and and that’s what all her kids will learn. I was left speechless as I could not argue with her that farming is not important. Put flour into a bowl. Add salt, ajwain, turmeric powder, chilli, ginger and garlic pastes. Mix well. Add grated radish and leaves. Mix. Finally form the dough using yogurt. Divide the dough into 10 to 12 parts. Using extra flour roll each part into a circle of nearly 5 to 6 inches in diameter. Put the paratha on the tawa. Let it cook on one side. Flip it over and cook the other side till small brown specks appear. Pour about a teaspoon of oil around the paratha. Cook on both sides till golden brown and done. Repeat steps 6 to 11 with the remaining dough. Serve hot parathas with pickle, curry or your favourite sabji. Add more finely chopped radish leaves. Make parathas immediately after you had kneaded the dough. If you leave it, the dough becomes too soft. 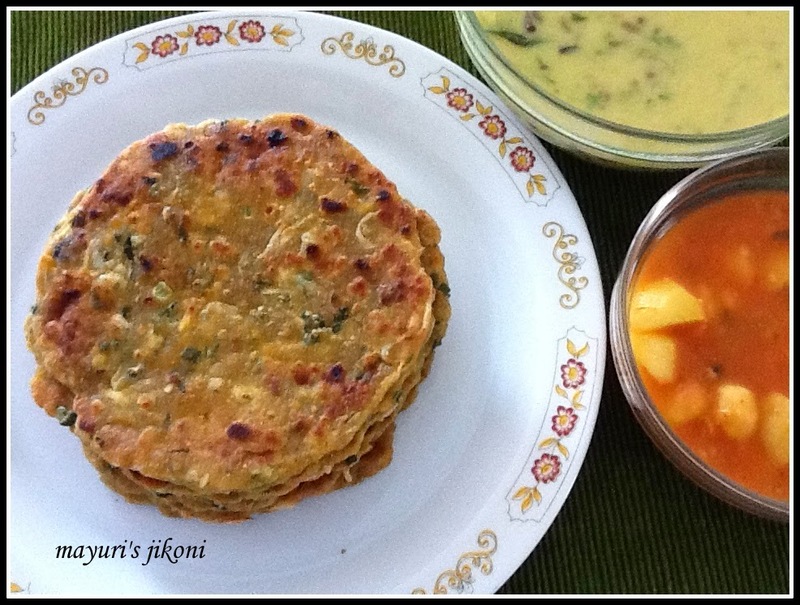 These parathas taste good on their own also as a snack or for breakfast.